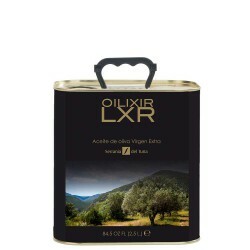 Olive Oil Can 3 L. Pago de Espejo Picual Bag in Tube. Pago de Espejo is an extra virgin oil from Jaen whose quality is far above other brands in the market despite being a relatively new and limited production and with a bottle design worthy of seeing. It is characterized by a green fruity with intense notes of grass, green almond and tomato, it is also a very fluid oil and with a great balance between bitter and spicy. Mill: Pago de Espejo. Jaén (Andalucía). Pago de Espejo is an extra virgin oil from Jaen whose quality is far above other brands in the market despite being a relatively new and limited production and with a bottle design worthy of seeing. Its mill is Pago de Espejo, located in Villanueva de la Reina, which mixes years of experience with innovation getting unique qualities that clearly label it as a Premium Oil. It is characterized by a green fruity with intense notes of grass, green almond and tomato, it is also a very fluid oil and with a great balance between bitter and spicy, so it has a very pleasant taste. Since it is an oil from Picual variety, it highlights its intensity, you can feel the passion in contact with the lips, something that makes this a unique and elegant oil. It is therefore an oil highly recommended to take raw. Try it with a plate of smoked meat or ham with a toast !!!! !